Ouvrir, partager, réutiliser. Regards critiques sur les données numériques, C. Mabi, J. Plantin, L. Monnoyer-Smith (dir. ), Paris: Éditions de la Maison des sciences de l'homme, 2017. In the age of the open data, digital data production, sharing and use are the result of a complex combination of socio-technical factors. This work provides a critical analysis of the processes and openness requirements leading to data provision, availability and re-use for the benefit of multiple players. Capitalization. A cultural guide, Collectif CSI, Paris: Presses des Mines, 2017. What does it mean to turn something into capital? In the context of the current debate on neoliberalism and financialization, this work offers an anthropological investigation on the culture of contemporary capitalism, where valuation is strictly dependent on the capacity to become an asset in the eye of an imagined investor. 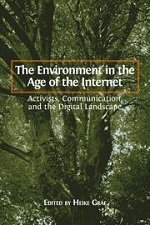 The Environment in the Age of the Internet: Activists, Communication, and the Digital Landscape, H. Graf, Cambridge: Open Book Publishers, 2017. How do we talk about the environment? This interdisciplinary collection focuses on the different communicative approaches to ecological issues around the world. Each case, examined in relation to its media coverage, helps to demonstrate how contexts determine communication, and how communication raises and shapes awareness. The special selection Migrants, exiles, refugees deals with the complex, internationally-crucial issue of migration. This book collection is meant to comprehensively address the topic, from a social, geographical, historical and legal perspective. Cybergeo publishes articles about the entire range of geographical issues in the main European languages. Discussions and exchange, availability of maps, feedback on geography-related articles and events: this journal is meant to be a networking instrument for the geographical community while increasing the external visibility of the discipline. The IFLA Rare Books and Special Collections blog is a dynamic news resource and an exchange forum on matters of particular concern to rare book, manuscript, and special collections librarians, including the collection, preservation, description, and use of such materials in all types of libraries worldwide. • October 11-13, Congrès des professionnels de l'information, Montreal, booth 08. • October 11-13, Frankfurt Book Fair, Frankfurt, Hall 4.2 E90. • October 17-19, ADBU Congress, Lille, booth 51.